The Art Specialists at Berkwood Hedge are passionate about art and strive to instill in every student a love and appreciation of visual art - allowing children the time and space to explore their own artistic expression and nurturing artistic confidence, so every child is able to create art using his or her own individual visual vocabulary. 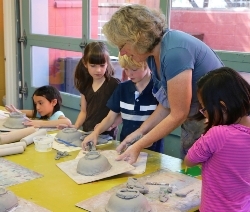 Ceramic work is an important part of the art program at Berkwood Hedge. The school has a kiln and students work with clay regularly.